There are a lot of Europeans with insomnia these days. I can tell by my blog stats. Go to sleep, dear readers. Nothing is THAT important. Pray for those who are in the seminary, that they may persevere and be encouraged by grace. .... "the resignation of Benedict XVI has suspended everything,” summarizes Celier, “we will not move until we know the name of his successor." Article on the priests...very important. The General Chapter of the summer seems to have even tightened the links between the Lefebvrists. "Communication within the Brotherhood has not been easy in the past,” continues Fr. B. “but last summer Bishop Fellay acknowledged that he should keep us better informed about the discussions with Rome." "SOME ARE FED UP, BUT NOT TO THE POINT OF LEAVING"
“Since then, the climate of confidence has grown between us." Join an Ordinariate? Few would see that as a resolution because on the doctrinal level they have not changed one iota: "We are always open to proposals from the Holy See, but do not force us to accept Vatican II! For forty years we've been saying that!” exclaims Father Jean-Yves Cottard Tours. "The Council has promulgated a text contrary to the Catholic faith –that concerning religious liberty. We cannot in good conscience accept this text … "
A former adviser to Her Majesty Queen Elizabeth II has urged the British Government to ensure children of the Royal family can never be raised Catholic. Lord Luce , the former Lord Chamberlain of the Queen’s Household, was speaking in a House of Lords debate last week about proposed changes to the anti-Catholic Act of Settlement. Under the Government’s plans, a first-born daughter of the Duke of Cambridge would become Queen, even if she had a younger brother, while Catholics would no longer be prevented from marrying heirs to the throne. However, Lord Luce urged ministers to hold talks with the Vatican to ensure Catholics were still prohibited from ascending to the throne. I think I need to do a serious fast this week and invite all my readers to do the same. Please consider an extra penance this week. Christian registrars will not be able to opt out of performing gay marriages if they object on grounds of belief, the Government’s human rights watchdog has said. [Présent:] -What will happen to the discussions and to the future of the FSSPX [SSPX: Society of Saint Pius X]? [Fr. Claude Barthe:] As unbelievable as it may seem, nothing is changed in the immediate future. I will make myself clear. Everybody now knows that the Ecclesia Dei Commission sent a letter to Bishop Fellay [Superior General of the Society] on January 8, and that an answer is expected from him by February 22, the day of the feast of the Chair of Saint Peter. The erection of the Prelature of Saint Pius X could be dated from this day, February 22. This would represent the true conclusion of the pontificate of Benedict XVI: the rehabilitation of Abp. Lefebvre. Can you imagine what thunderous roar [this would be] and even, indirectly, what weight this would have in the orienation of the events of March? This startling response by Fr. Barthe is also mentioned today by Vaticanist Andrea Tornielli. Source: Présent, Feb. 16, 2013. "Well, now is the favourable time, this is the day of salvation" (2 Cor 6:2). The words of the Apostle Paul to the Christians of Corinth resonate for us with an urgency that does not permit absences or inertia. The term "now", repeated several times, says that this moment cannot be let go, it is offered to us as a unique opportunity that will not be repeated. And the Apostle's gaze focuses on sharing with which Christ chose to characterize his life, taking on everything human to the point of taking on all of man’s sins. I missed these last year, but I am saying a little prayer that I can see them before the end of the month. Being at Fountains and seeing the snowdrops would be close to being in heaven for me! In five little known radio speeches made in 1969 and published again a while ago by Ignatius Press in the volume“Faith and the Future”, the future Pope gave his vision of the future of man and the Church. His last teaching, which he read out on “Hessian Rundfunk” radio on Christmas day, had a distinctly prophetic tone. I wanted to put a twitter-bird on my blog, as I am a member of the Tweeple clan, but I have had to change my twitter password FOUR, update, FIVE times because of security issues in one week. No bird will rest here--maybe it is a European problem. DoC Part 35--Did Christ say feed my goats? It is interesting that the Gospel of the Mass I attended today had the reading of the sheep and the goats being separated at the end of time, in the Final Judgement. Here is what Anselm has to say in two parts. There is at least one famous priest who should meditate on these writings of the Doctor of the Church, instead of following von Balthasar. There are footnotes marked for you to go to the original site on line for these texts. A Meditation on the Day of Judgment, wherein the Goats shall be set on the Left Hand. And, a pastor reminded me that Christ never said "Feed my goats." Why? A Meditation on the Joy which shall be where the Sheep shall be set on the Right Hand. BUT while these are in woe, and for distress of spirit are uttering the lamentable groanings of their hearts, what thinkest thou will be the joy and exultation of those blessed ones, who shall be set at the right hand of God and hear that most blissful voice which shall say unto them, Come, ye blessed of My Father, inherit the kingdom prepared for you from the foundation of the world.128 Then verily shall the voice of joy and health abide in the dwellings of the righteous.129 Then shall the Lord lift up the head of the meek, who now refuse not to be counted vile and outcast for His sake. He shall heal the broken hearted, and console with everlasting joy them that weep for longing after Him in this earthly pilgrimage. Then shall be manifested their unspeakable reward, who for love of their Creator rejoice in the renunciation of their own wills. In that day shall a heavenly crown be set upon the heads of them that serve Him, and the glory of those that wait patiently for Him shall shine forth with splendour ineffable. There shall love enrich His faithful soldiers with the fellowship of angels, and purity of heart shall bless Creator.130 Then shall that song be sung by all them that love Him with the blessed vision of their Creator....Then shall that song be song by all the elect: Blessed are they that dwell in Thy house; they will be alway praising Thee.131 In which song of praise may He vouchsafe to make us partakers who with the Father and the Holy Ghost liveth and reigneth God, world without end. Amen. Part of the way to perfection, especially in the purgative state, involves thinking of one's death and judgement. This is a particularly salutory exercise during Lent, and therefore, on this first Monday in Lent, I refer to Anselm concentrating on the way to perfection by contemplating on our day of judgement. 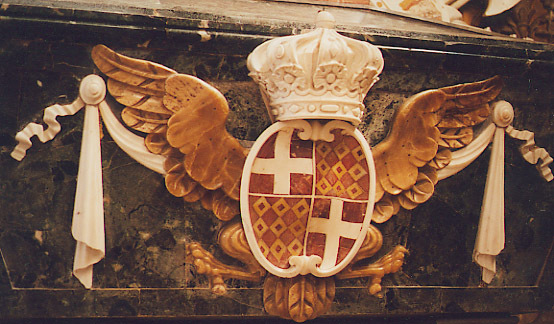 All the photos are from St. John's Co-Cathedral in Malta, which I consider one of the most beautiful churches in the world. Thanks to wikimedia for some of the small ones. Of the Soul after her Separation from the Body. O GOOD God, what is it that I behold? Lo, there cometh fear upon fear, sorrow upon sorrow. After she is separated from the body, the soul shall be beset by a multitude of evil spirits, who shall hasten to meet her and shall magnify their accusations against her. And inquisition shall be made concerning all things whereof they accuse her, even to the least of the negligences that she hath committed. There shall come the prince of this world with his companions, raging with fury, cunning in deceit, skilful in lying, malignant in accusing, bringing forth against the soul all that he can of the evils that she hath done, and devising falsely many beside that she hath not done. O terrible hour, O severe judgment! On the one hand will be a Judge most strict in judgment; on the other adversaries most wanton in accusing. The soul shall stand alone with none to comfort her, except she be defended by the consciousness of good works. But in that great severity of judgment, wherein all things shall be laid open, who shall boast that his heart is clean? If the righteous scarcely be saved, where shall the ungodly and the sinner appear? Then shall idle gladness depart, the pomp of place shall be put to flight, the pursuit of worldly greatness shall be proved deceitful. 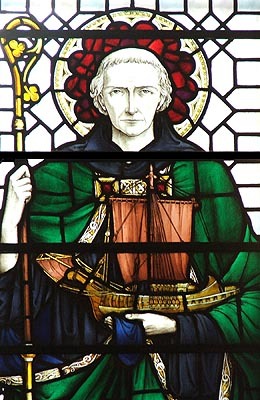 Blessed is the soul, which in that judgment a good conscience defendeth, and the remembrance of a holy life protecteth; which, while she was yet in the flesh, was often cleansed by the water of repentance, adorned with earnestness of confession, enlightened by meditation on God’s holy law; which humility made gentle, and patience quiet, and obedience free from seeking her own will, and charity fervent in the performance of every virtue. Such a soul shall not fear that dreadful hour, and shall not be ashamed when she speaketh with her enemies in the gate. For she will have fellowship with them, of whom the Scripture saith: When He hath given His beloved sleep, behold the inheritance of the Lord. BUT who can say anything of that terrible sentence of the Last Judgment, whereby the sheep shall be set on the right hand and the goats on the left? How great shall be the trembling when the powers of the heavens shall be shaken? How great the confusion, the lamentation, the crying of those that howl, when they that neglect to do good shall be met by that terrible word, Depart from Me, ye cursed, into everlasting fire. Verily that day is a day of wrath, a day of trouble and distress, a day of wasteness and desolation, a day of darkness and gloominess, a day of clouds and thick darkness, a day of the trumpet and alarm. Verily bitter is the voice of the day of the Lord; the mighty man shall be afflicted therein. For they that in the pride of their hearts despise the will of God, boast themselves now in the following of their own wills; but then shall they be cast into everlasting fire which shall not be quenched for ever, and the worm that dieth not shall feed upon them, and the smoke of their torment shall ascend up for ever and ever. Of course, one of our ladies who is one of the newest Doctors of the Church and a Benedictine, Hildegard, I covered posts ago. The great Benedictine Doctors include SS. 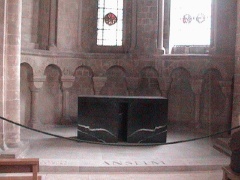 Anselm, Archbishop of Canterbury, Bede the Venerable, Peter Damian, Gregory the Great, and the reformer of the Benedictine Order, Bernard of Clairvaux. Seriously, I shall be spending most of the week, if not longer, on these illustrious men. Because I am in England at this time, I shall start with the two great Doctors, Anselm and Bede. I have not paid any attention to chronology, so it does not matter this week, either. So, as a summary, the Doctors covered so far have been Hildegard, Therese, Teresa, Catherine, John of Avila, Albert, Aquinas, Bonaventure, Anthony of Padua, Lawrence of Brindisi, and Francis de Sales. Please follow the tags at the bottom for the entire series. For Anselm, (1033-1109) I am not going to get into the argument about God as "maximal perfection". although that might help some people follow his thinking about God. I have actually taught the Proslogion and Monologion in the past and do not want to deal with those texts on this blog.